Guidance and Control - II focuses on the techniques and processes involved relative to the control of rockets, missiles, and other space vehicles. 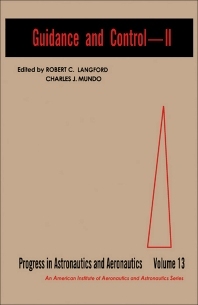 Divided into seven parts with 36 chapters, the book focuses first on active and passive control for space vehicles; advances in attitude control; the stabilization of earth satellites; and the theoretical and practical considerations of solar pressure attitude control for interplanetary space vehicles. The compilation also notes the use of gyrostabilizers on satellites, including the use of two-pulse attitude control and bank angle control for an asymmetric spinning satellite. Experiments on gyro rotor imbalance on a stable platform and various navigation and guidance systems are also presented. The book also looks at the use of sensors, the stellar techniques for interplanetary flights, and control of space vehicles. The text also gives emphasis on various mathematical equations used to measure fuel optimization in orbital rendezvous. Guidance techniques in lunar landing are also discussed. The compilation is important for readers interested in studying the methods, principles, and processes involved in the control of space vehicles.